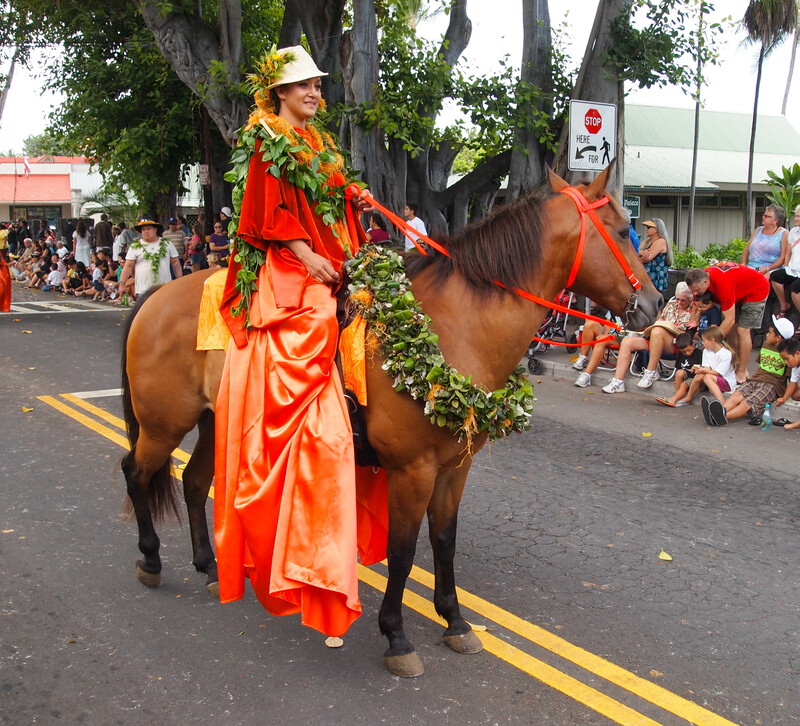 Since the early 1900s, pa‘u riders have brought a quintessential Hawaiian style to floral parades across the state. A type of culotte or skirt, the pa‘u is made of a single piece of fabric, usually nine or 12 yards in length, wrapped around the rider in such a way as to flow regally over the stirrups and to the ground. The pa‘u is held in place with kukui nuts that are twisted inside the fabric, tucked into the waistband for a secure fit. With the pa‘u queen and her unit leading the way, each pa‘u princess presides over her own unit representing one of the eight Hawaiian islands. They are joined by their respective attendants, outriders and page — all adorned in the flowers and colors of the islands they are representing. A unit representing the Island of Hawai‘i, for example, will traditionally wear red attire and lei made of red lehua blossoms, while a unit representing O‘ahu would showcase yellow ilima and yellow attire. When riding for Lana‘i, the princess will showcase lei made of orange kauna‘oa, for Maui, the pink lokelani, and so forth. Through the years, floral parades have become more flamboyant and elaborate, especially in Honolulu where pa‘u units compete for best of show. But traditionalists emphasize the importance of refined elegance and skilled horsemanship over the massive floral arrangements and ornate costumes that have filtered into modern-day parades. Preparing for parade day involves intense work for each unit, whether gathering natural materials from the mountains and makai, sewing garments, creating banners, prepping the horses, practicing equestrian skills, making lei or learning pa‘u wrapping techniques. There are different methods for wrapping, depending on family tradition. Some start from front to back and use just a few kukui nuts to hold the skirt in place, while others gather the fabric from the back, using up to eight kukui nuts. The history of the pa‘u dates back to the 1800s following the arrival of the first horses in the Islands in 1803. Women in Hawai‘i quickly became accomplished riders, utilizing the pa‘u for practical purposes. The earliest pa‘u skirts were fashioned from fabrics of the day, primarily calico or gingham, fastened at the waist and ankles with rope so that both feet were covered. The arrival of floral parades in Honolulu in the early 1900s ushered in more elegant fabrics like satin, as well as lei for horse and rider. “The pa‘u was originally worn as a protective covering to keep a woman’s fancy garment from getting soiled on the way to a party or gathering,” said Barbara Nobriga of Mahealani Ranch, who has been at the forefront, for decades, of organizing floral parades in Kailua-Kona.